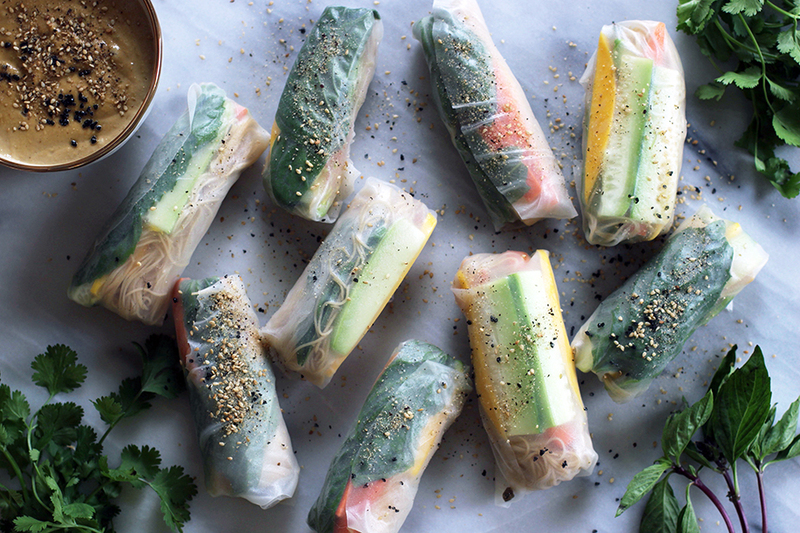 Salad rolls are fun to make and so delicious to eat. My girlfriend and I made these this past weekend for a friend’s house warming celebration. They were a hit! The spicy peanut sauce is the perfect match for the fresh, crisp veggies in the salad rolls. I love the addition of mango for a touch of sweetness. In the summer, I’ve also used peaches instead, but you can use any fruit you like. If you find yourself with leftover ingredients after you’ve made all the rolls you want, you can always make a deconstructed salad roll salad. Makes for a great weekday, workweek lunch. 1.) Prep all the veggies and put into small bowls for easy assembly. After cutting the tofu, toss to coat with tamari or liquid aminos. 2.) Soak the thin brown rice noodles in warm-hot water until tender. Once they are done, drain from water then toss in a large bowl with tamari or liquid aminos. 3.) In a small skillet, heat a tablespoon (give or take) of coconut oil over medium-high heat, and sauté the garlic and ginger until both start to brown. At the end of cooking, add the peanut butter to soften. Pour mixture into a high-speed blender or food processor. Add any amount of jalapeño (remember, you can always add more! ), lime juice, coconut sugar and warm water. Blend until smooth. You may need to adjust the water measurement depending on how you want the consistency of your peanut sauce. 3.) Once you are ready to assemble the salad rolls, fill a glass pie pan (or similar size pan) with very hot water. Place one rice paper wrapper into the pie pan and allow to soften in the hot water (about 1-2 minutes). Slowly remove the rice paper from the water, being careful not to let it overlap on itself the best you can. [Note: I usually hold the paper over the pie pan of water to allow the excess water to drip off.] Place the softened rice paper on a plate or flat surface for rolling. 4.) Pile the whole mint, basil and/or cilantro leaves, noodles, tofu, avocado, cucumber, mango and carrot in the center of the rice paper. Be sure not the overfill the salad roll. It’s best to leave about an inch on either side and about 2 inches on the top and bottom. To roll, pull up the bottom of the paper over the filling to secure tightly. Holding this in place with one hand, fold each of the sides in with your other hand. Roll to the end and use your hands to tuck the filling in as you go, trying to keep as tight a roll as possible. Sometimes I cut off any excess of the paper at the end with a pair of kitchen shears, but this is not necessary. Repeat steps 3-4 until all the rolls are made. You will likely have to change out the water in the pie pan a couple times as it begins to cool. 5.) Garnish the finished rolls with gomasio and serve with spicy ginger-peanut dipping sauce. Rolls will keep for 2-3 days, but the rolls are best served fresh the day they are made. If storing, be sure to either wrap in plastic wrap, or use a damp paper towel to separate each roll. The rolls will stick together if they are touching.